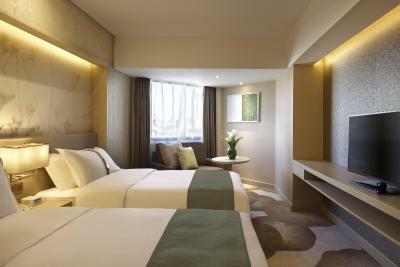 Lock in a great price for Holiday Inn Kunming City Centre – rated 8.2 by recent guests! The value for money, location, and especially the staffs are super helpful. Thank you again for your assistance to make our stay a great holiday. A must stay hotel if you are staying in Kunming city center. Smart reception team and lot of choices for breakfast. Good location. I enjoyed and shall come with my family again. Beds were very comfy..options of hard and soft pillows much appreciated. Thai restaurant was great. Reception staff was very helpful. The staff at the hotel were very nice althought their English skills were not great. They were also very helpful with our requests. The rooms were spacious, very confortable and nicely decorated. Everything was very clean. Breakfast had an excellent variety of Western and Asian food to suit all tastes. The hotel is only 15 mins walk from the City Center. One of our top picks in Kunming.Only 0.6 mi from Nanping Walking Street, Holiday Inn Kunming City Center features accommodations in the CBD with free WiFi in all areas. It offers an indoor swimming pool, a fitness center, a garden and 3 on-site dining options. 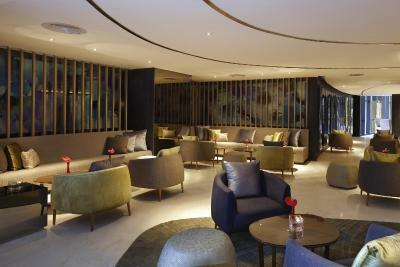 Holiday Inn Kunming City Center is 0.7 mi from Golden Eagle Shopping Mall and 7.5 mi from Dian Lake. It is a 10-minute drive from Green Lake and a 30-minute drive from Kunming Changshui International Airport and Kunming Dianchi International Convention & Exhibition Center. Each room here will provide you with a satellite TV, air conditioning and a mini-bar. Complete with a refrigerator, the dining area also has an electric kettle. Featuring a shower, private bathroom also comes with a hairdryer and bathrobes. Extras include a seating area. Staff at the 24-hour front desk will be glad to assist with luggage storage, ticketing services and currency exchange. Business facilities are provided upon request. Free public parking is possible. The on-site Yunyuelou Chinese restaurant serves authentic local food, while Thai dishes can be enjoyed at the Chim Thai restaurant. Refreshing beverages are served at APM Coffee. 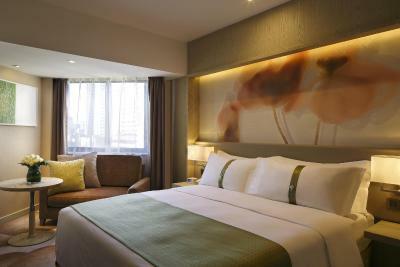 When would you like to stay at Holiday Inn Kunming City Centre? This double room has a flat-screen satellite TV. Extra charge may apply to extra bed required. You may find more information on site. The bedding type for a twin or double bed is subject to availability. This suite features an extra large double bed, a sofa, a flat-screen satellite TV, a mini-bar and ironing facilities. 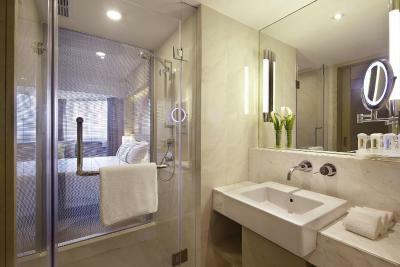 The private bathroom comes with bath or shower and free toiletries. This twin/double room has air conditioning, bathrobes and seating area. House Rules Holiday Inn Kunming City Centre takes special requests – add in the next step! Holiday Inn Kunming City Centre accepts these cards and reserves the right to temporarily hold an amount prior to arrival. Air condition was not cold. We asked for technician to check (at night) and it wasn't better so we got an electric fan!! We hope that hotel will fix it next day but 2nd night was still the same we had to open electric fan and open the window. When we checked out, front desk staff asked us how was the service. We told them about air condition. They said sorry and unfortunately fully booked so can't change the room. (I thought ...really?) By the way, front desk staff asked us to do the survey and give them more than 8 score because blaa blaa bla. The dinner timing is rather short which maybe OK for early diners. The breakfast was sumptuous and delicious with good variation. The location was very central and convenient except for the current construction disturbance that will be over soon as per the progress. Unfortunately, while I am on the non-smoking floor; the smoking smell is emitted to my room via the bathroom ventilation and I get it every single day. The majority of the residents are Chinese who sometimes can hardly observe the regulation of the hotel. They smoke in the bathroom. It would be interesting to see the hotel install smoke detector in each room on the non-smoking floor. They can then catch and stop these customers. If there is a law to punish them, even better. The staff are all very helpful. They are polite and can respond to request quickly. The location is close to a new creative park which has restaurants and a new bookstore. It is close to a subway station entrance. Room is clean thoroughly. Bed is made neatly. We made a mistake of taking the airport shuttle thinking it would end in front of the hotel. It stop short by a long way so we had to flag down a taxi in the middle of the busy bus stop to get to the hotel. It is better to take a taxi straight to the hotel. It looks like there is a major road work near the hotel at the moment. It was a bit noisy at night for the light sleeper. We like the ambience of this hotel. We are impressed by the patience and helpfulness of the manager Michelle Chen and her colleagues. Michelle is very knowledgeable and gave us tips on how to take the metro and helped us with day trip ideas. The beddings are fresh and clean and the mattresses very comfortable. There is a very good variety of delicious food at the restaurant within the hotel. We tried the room service menu and was equally impressed by the quality of food served. Concierge is also very helpful as we needed to move room on arrival due to air conditioning irregularities. It is a good exercise to cross the pedestrian bridge and walk towards Dongfeng Square. Walk slightly further down and you reach huge malls with lots to offer. When we came back in the evening, the room smelled incredibely of cigarette smoke, even though it was a non-smoking room. It seems there a smoking rooms available and the smoke (or odour) might go through the ventilation. This was a no-go for me, I am fine with smoking in restaurants and bars, but I really do not want the smell where I am sleeping. Actually, I could not sleep because of the smell. We stayed only for one night. The rooms are big and comfy, this was so far the best bed and bathroom we had on our travels in China. You can order different pillows from a menu. Breakfast is good. I found the staff could speak English quite well but were not always able to answer questions (like how much the taxi costs until this and this train station in Kunming). The room did not correspond at all with the room we booked, the reception told us that they where aware of the fact that the photos did not match with the real situation but they did not offer any alternative. At night the airconditioning in the hotel was out. As the temperature inside was 25 degrees we had to open the window, but as the construction activities in town are 24/7, this was very unpleasant. Besides there is no musquito protection installed, something that suprised us, even in the cheapest hostels we had on our round trip through China, there was mosquito protection. When we came to the reception next morning we advised them to consider turning the airco on at night...we where asked to leave a positive review on Booking. Not the reaction we expected! Not a good quality pice ratio in Holiday Inn kunming so to say, and we can know because due to illness we had to stay for some time in Kunming and had three different hotels. We stayed one night in Holliday Inn and then got back to our last hotel, cheaper and better. The Thai restaurant downstairs was pretty good! English speaking staff helpful on a quick 1 night stopover for my international flight. Room comfortable and staff on phone, reception, restaurant, front door all very helpful. Early departure had a breakfast box. Swimming in hotel pool requires to wear a cap. No shuttle service to city centre. Good rooms and very confortable, they have several restaurants in the hotel and you can always find something different to eat. The Thai restaurant inside is absolutely amazing!